How to raise oxytocin levels, deal with cost of Coke, use a lucky charm, get green beer for St. Patricks, and enjoy wine and cheese for good health. 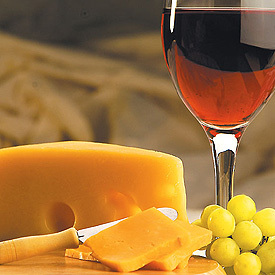 Wine and cheese party FOR YOUR HEALTH? You bet! A recent Dutch study found that women who drank half a glass of red wine daily were almost 50% less likely to develop heart disease. Red wine contains resveratrol and polyphenols that increase good HDL cholesterol levels and help prevent damage to blood vessels. Equally interesting, that half a glass also lowers your risk of obesity and diabetes according to the study author, Martinette Streppel, Ph.D. Cheese has almost as much benefit when nibbled in small amounts and for many of us, the good news is six 8 ounce cups of coffee per day cuts your risk of diabetes and inflammation. And did we mention the proven benefits of dark chocolate? Have a great ST. PATRICK’S DAY and if you can’t find an Irish pub on the 17th, just put a few drops of green food coloring in your favorite pale ale or light lager! 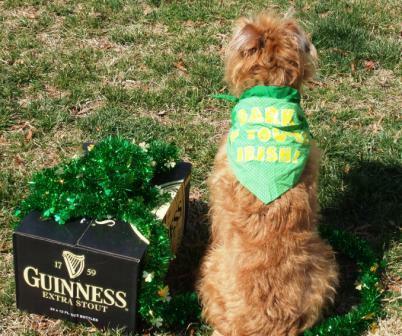 Or ask this Soft Coated Wheaton Terrier where he got his Guinness. Dog breeders, particularly those who show their own dogs, get plenty of exercise but here’s a tip for anyone trying to shed a few more pounds. Dr. Julian Whittaker says it is WHEN you exercise that counts. Most of us let the dogs out before we eat but hear this - 15 minutes of vigorous exercise or 30 minutes of cleaning runs, if done before breakfast, burns the most fat-calories. Why? Because you have “starved” for 8 to 12 hours so early morning exercise before food burns more fat. After you eat, exercise burns donut-calories, not those stored in your body fat. LUCKY CHARM? According to a recent study in Current Directions In Psychological Science, keeping a good luck charm in your pocket or as jewelry can actually change your luck! From a practical standpoint, the scientists believe that just thinking you have a lucky edge subconsciously prompts you to think and act in ways that make it more likely for good things to happen. The odd thing is that even subjects who did not believe in superstitious charms, reported that they achieved a promotion or some other significant “stroke of good luck” occurred. RISING COST OF HEALTH CARE is exemplified in more ways than one by the cost of a Coca-Cola™ which contrary to Mayor Bloomberg's idea, is still available at nearly $2.00 per serving. First bottled in 1894, Coca Cola was promoted as a cure for headaches. At 5 cents per glass, it was a legal bargain and it wasn’t called “coke” for nothing! Hold your partner’s hand (or finger) as you walk across the parking lot. Yeah, just like a mother dog and her newborns react to touch stimulus, touching someone you love increases your levels of oxytocin. Oxytocin release, even in small amounts, helps you relax and feel more contented and the association of a quick hug or hand holding can bond you to that person in a special way. Better than chocolates on Valentine’s Day.